King Richard’s Fair! 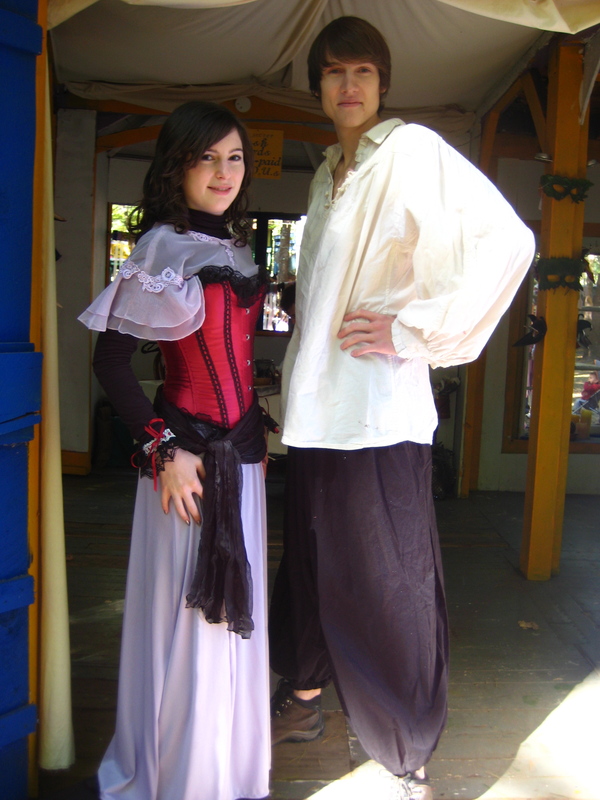 This was my first renaissance fair, a fact that surprised many of my friends. I suppose they all would expect someone like me to have attended a ren. fair before. Alright, I will treat this blog post as I would a review of any convention. So here we go..Shauna’s review of the King Richard Fair. Location: Carver, MA in the woods at their permanent fair grounds. The parking lot was huge, and the front gates looked really cool: it was a giant wooden castle with flags and trees on either side. Once inside, we were literally in the woods. There were trees everywhere, and within those trees, houses lined the pathways of the fair grounds. The grounds really were not that big, though they seemed it at first. My friends and I were only there for about six hours, and though we passed the same shops many times, we found something new to explore each time we did. I thought that the fair ground was quite adorable, though sometimes tricky navigate over the rocks and branches coming up out of the ground. I would imagine that things would gete quite messy if it were to rain, but fortunately, we had absolutely perfect October weather. TINY. I just barely fit in there with my costume, and if you didn’t know, I’m really small. I cannot imagine the impossibility of going to the bathroom in a petticoat or hoop skirt. And even though we were in the woods, the edges of the fair grounds were fenced off, so its not like you could go run behind a far-away tree to get a little space while you do your business. Cleanliness: The fair ground were very clean. There was no litter or signs of animals or even bugs. (It is October though). And because we were outside in the open air, there was absolutely no “con-funk” as convention-goers refer to it. Everything, except for the horses, smelled wonderfully. Did I mention how good the food smelled? I didn’t eat anything because the food was based on a ticket system where one ticket costs 50 cents, and you pay for your food in tickets. I didn’t understand this at first, and thought a pretzel was 7 dollars when it was really 7 tickets, which is only $3.50. So I didn’t eat while I was at the fair. Cost: I strongly recommend trying to get a group discount because then the cover charge is totally reasonable. Otherwise its a little much, though still less than any Anime Convention. You can find details at the King Richard’s Faire Website. Shopping at the faire was really fun, but everything was a fortune. All of those hand-made leather goods and metalworks. I can understand why some of the those items would be $500, or $900, but come on, I’m not going to pay $300 for a cloak. 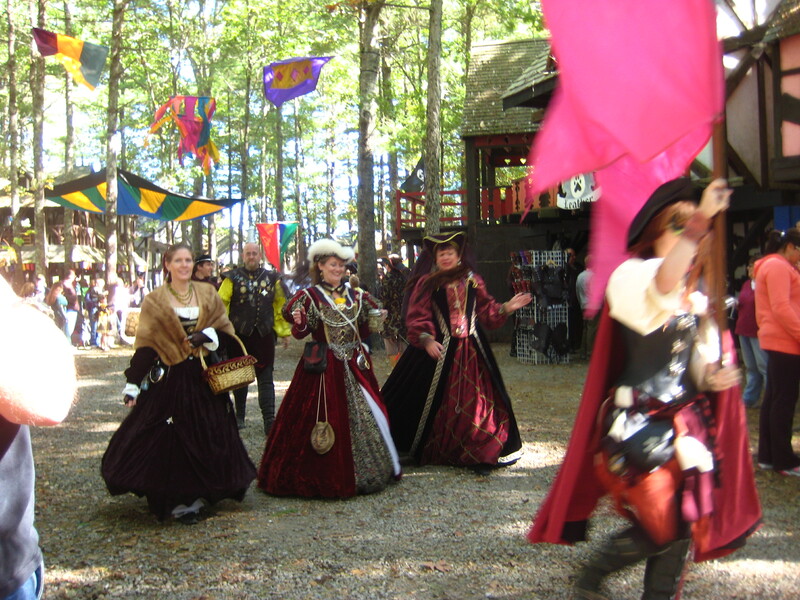 If you’ve got lots of money to burn, then yeah, go shop at the Renascence faire, and if not, stick to Etsy and ebay. Entertainment: The entertainment was great, though I only saw a few shows. I saw this whip act which was really funny and he was very talented. He broke targets with a whip when they were in his mouth or on his head. And that was a real, big, dangerous whip, so it was quite a cool thing to see. 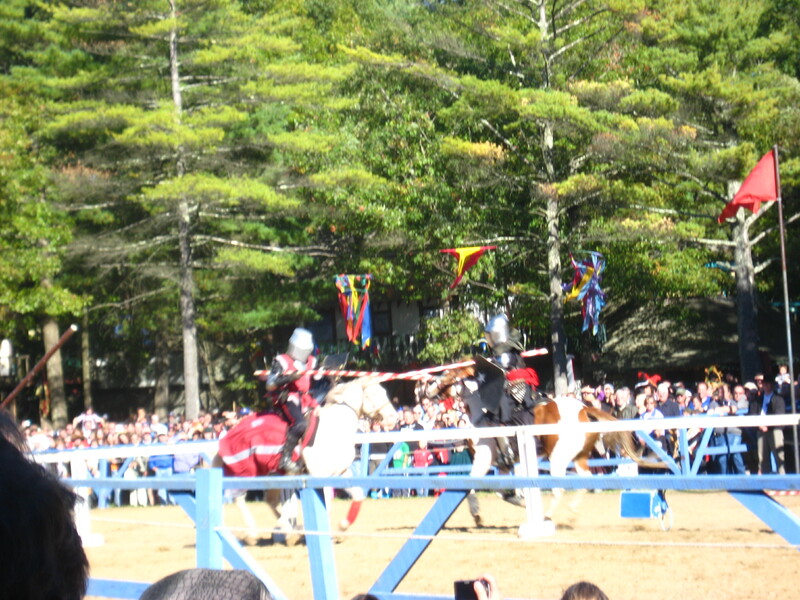 The other show I saw was the king’s Tournament where knights on horse back would compete and joust and what-not. There were sword-fighting as well and it all looked great from where we were sitting and there was lots of audience participation. I have some videos from the fights at the bottom of the post. Other entertainers were walking around playing music, and there were many other stages were entertainers were singing or dancing. There were also games like knife throwing and archery, as well at psychic readings, though the games and readings costed money. 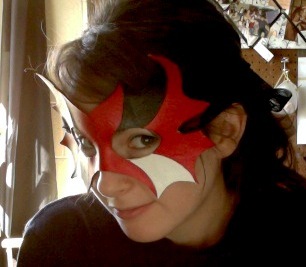 Costumes: Dressing up for the fair was great fun. It was wonderful to get to wear a costume again in the fall. I really like year-round costuming, and a ren faire presents a wide variety of warm winter costumes. I liked that for a change, everyone was dressing up as their own characters instead of cosplaying. There were some really gorgeous costumes, but it wasn’t really the kind of place where everyone was taking pictures. Of course I’ve committed the loveliest of costumes to memory, and am now inspired to work on a line of renascence costumes for myself. I had a really funny experience at one corset shop: I wanted to buy another corset, this time, one that was actually in my size. So I go in and I ask about the smallest sizes they have an all. Turns out, I am a size 18″ corset. That’s 18 INCHES that my waist can be compressed down to. They didn’t even have any that small, so they put me in a size 20,” and I felt quite compressed enough. It was kind of amazing to see myself fully corseted. And weird. It was a little painful while they were tightening it, but once it was all tightened up, it didn’t hurt, per say, but I didn’t feel like I could walk very far like that. I wish I could have taken a picture, but they didn’t allow it. So instead, I have a picture of me in the corset that I actually own, in my costume for the fair, not nearly as compressed as I can be. In fact, this corset is a little too big. Oh, I did buy one thing while I was at the fair, and that is this mask from The Eccentric Perspective, painted by the wonderful JoshPegg who needs to get a website so I can link to him. All in all, it was a great day. I wish that the faire was just a little bit closer to school so I could go back more than once. But I’m sure I will be back in the future because I had a wonderful time-traveling time. 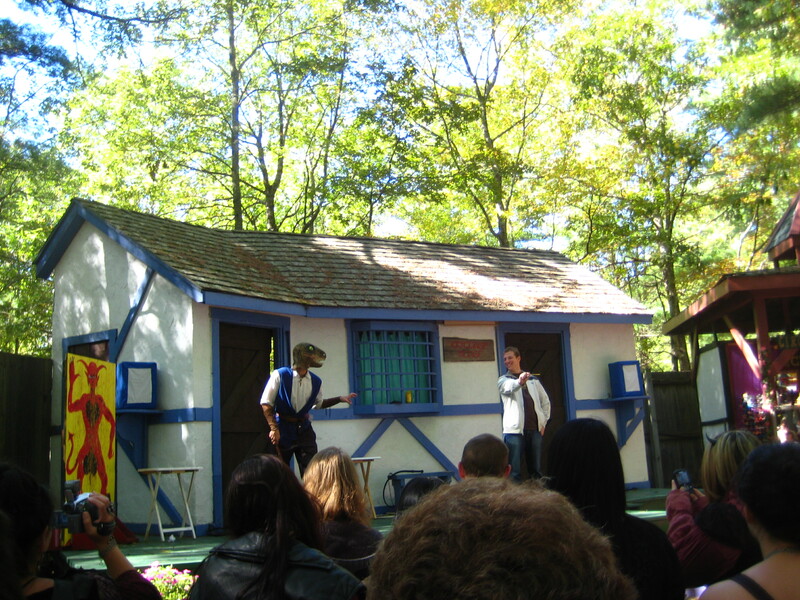 I would give the King Richard’s Faire a four out of five stars.